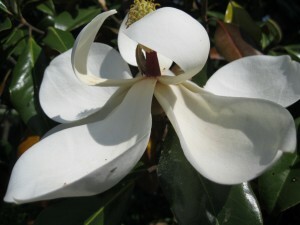 The Magnolia Grandiflora is a long-time symbol of the South’s natural beauty, and blooms beautifully with its massive cream-white flowers from April through July. This magnificent tree is named for French botanist Pierre Magnol, who studied the species more than 300 hundred years ago. Magnol and other scientists concluded that the Magnolia family is the oldest blooming species in the world, having existed more than 100 million years. The tree is so old that it predates the honey bee, and was pollinated by beetles originally. Having survived for so many eons, the species is notable for its healthy parts, which have been used for a variety of ailments since ancient times, and proved helpful for the south during the War Between the States. The Federal blockade of Southern ports that began in 1861 cut off military supplies as well as medicines that the people of South Carolina desperately needed. With soldiers and civilians suffering and dying, some remedy for wounds, fevers, and ills was crucial, and ended up coming from a natural source. Charleston doctor Francis Peyre Porcher was, like many in his day, a naturalist as well as a man of medicine. He used his considerable knowledge of botany to publish a 600-page book of natural remedies in 1863 called Resources of the Southern Fields and Forests. Countless lives were saved by the thousands of natural remedies spelled out in Porcher’s book, including concoctions made from the Magnolia flowers, cones, seeds, bark, leaves and roots. 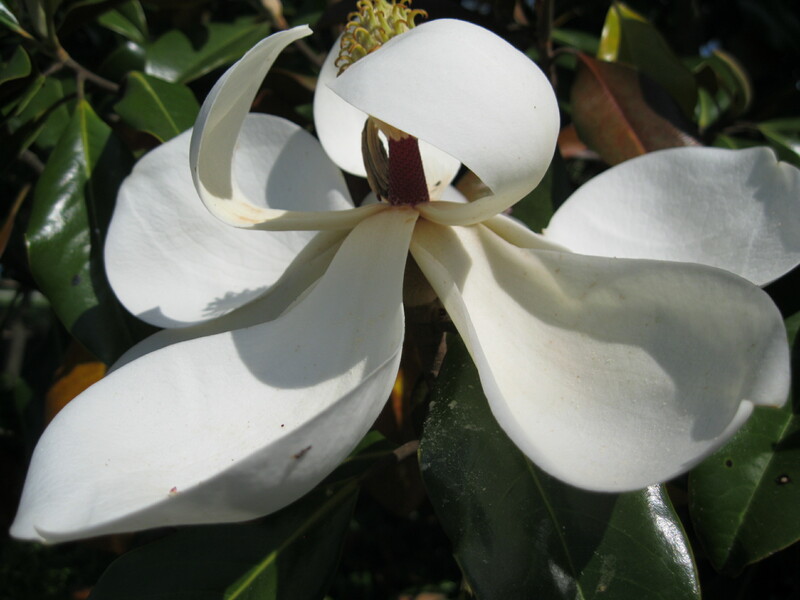 The Magnolia parts were ground into powders, mixed with brandy, or sun-dried and pickled to help overcome respiratory and nerve issues, joint pain and swelling, nausea and eye inflammation, as well as infections and fevers. This June will mark the centennial of famed ironsmith Philip Simmons’ birth in 1912 on Daniel’s Island. Mr. Simmons went to work at a Calhoun Street blacksmith shop at age thirteen, learning to fix wheels and axles of wagons and carts, pounding iron by hammer on anvil each day in the heat of coal furnaces. He was fascinated by the decorative iron work that had graced old Charleston since colonial times, and by his twenties began to fashion his own creations as ornamental gate work. 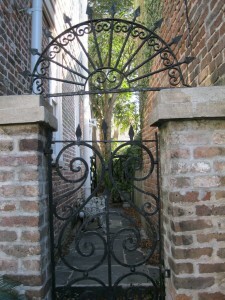 His first decorative gate made in Charleston stands in Stoll’s Alley today, what he called his “billboard gate”, which he used to show people what kind of work he could do. Ever-so-slowly, his clientele increased, and the reputation of his work spread. From his little shed on Drake Street in the East Side, Mr. Simmons diligently pounded away, and won as many accolades for his work as he did for a kind, gentle disposition. I got to know Mr. Simmons very well in his later years when I did programs for a local television station, and among the many shows I did on him was a 1998 documentary called “Philip Simmons –Fire and Iron.” The last show I did with Mr. Simmons was in 2005 as part of my “Carolina Explore” series with Comcast. He was well over 90 at the time, but still banged away on the molten iron as an instructor at the American College of Building Arts inside the old District Jail on Magazine Street. Never bitter over his poor background and the fact that he descended from slaves, always gracious in thanking wealthier patrons who bought his work for generations, Philip Simmons was a man who transcended class and racial differences in Charleston and proved throughout his brilliant career that creative genius can come from an inner passion and joy, glowing like the sparks that framed his determined face for more than ninety years. 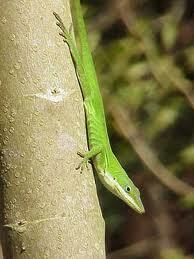 As Charleston’s weather warms, interesting creatures emerge, including the colorful Green Anole. Pronounced “anowlee”, this crawling critter is biologically known as Anolis Carolinenis, and is often confused with the gecko or the chameleon. Anoles can change colors, and pigments vary from green to brown, apparently adapting to the foliage in which they live and hide. Anoles are predators of small insects and spiders, but their tiny toothless jaws are hardly a threat to human fingers, as I often show on my tours when I can manage to grab one and display its features before letting it go to scamper back into hiding. At the Historic Charleston Foundation building where I begin each tour, anoles can be seen climbing vertically along brick walls, aided by an adhesive pad on their feet. One in particular seems to show up and crane his neck as if listening to my opening remarks, so I’ve begun to call him “Cornelius” and point him out to guests. Cornelius is recognizable as a male anole by virtue of his “dewlap”, a section of skin under his chin that flares out in a bright red protrusion when showing off. This is a means of making himself attractive to female anoles and threatening to male competitors, and Cornelius rarely disappoints. Anoles can be acrobatic, jumping from vertical surface to vertical surface, such as one did the other day on the famous gate at 37 Meeting Street. Being cold-blooded creatures, they seek surfaces warmed by the sun, such as gates, gas meters, and walls, and will often squeeze through tiny gaps in window screens looking for prey, ending up darting across some of Charleston finest historic floors. Any creature that can be so colorful and entertaining, while at the same time helps rid us of bugs, should be welcomed, and rather than killing it, can be caught and let go back into the wild. 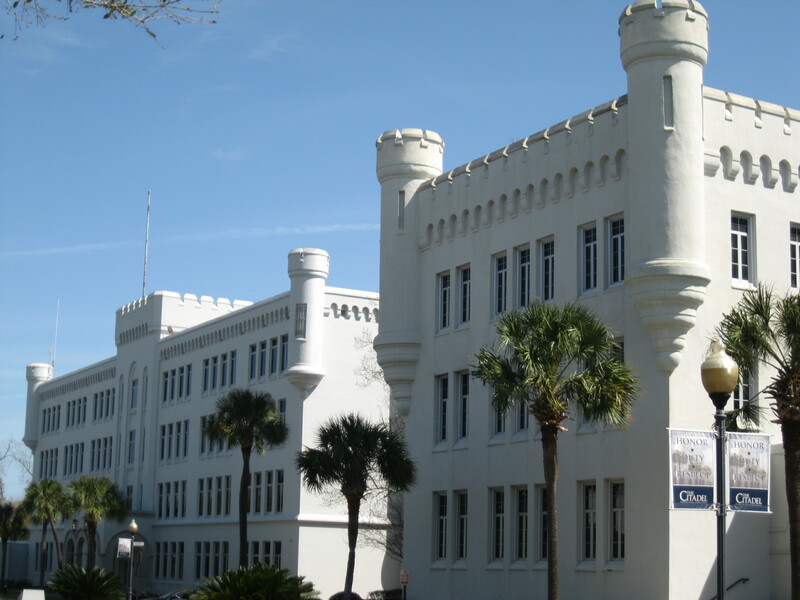 The current Citadel campus dates to 1922, built along an Ashley River bluff that was once known as Indian Hill. During colonial times, the 76-acre area was a dueling ground and used for to train militia. 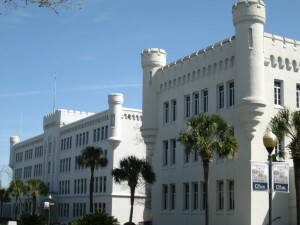 Moved from its original location on Marion Square, where the first cadets attended classes in 1843, the new classrooms and barracks were built as copies of the old Romanesque castle style. New traditions were quickly born, as the Avenue of Remembrance was created in 1928 with memorials honoring graduates killed in military service. The famed Summerall Guard was created in as a precision drill team, and by 1932, Charleston crowds would take trolleys to the campus to watch parade ground marches and exercises, and the Friday afternoon dress parade is still a great custom today. During World War II, 10,000 Army recruits trained at the Citadel campus, and the corps of cadets boasted a higher percentage of graduates serving in the armed forces than any other college other than the federal service academies. One of World War II’s most famous generals, Mark Clark, became president of the Citadel in 1953, and under his leadership, area marshes were filled, new barracks and halls were built, as well as an athletic field house, a new football stadium, and a 90-foot carillon bell tower. Gen. Clark died in 1984, and is buried on the campus today. The Citadel is part of the South Carolina state education system today, and besides its corps of cadets, features a highly-regarded civilian graduate school program. Hoever, it is the corps that keeps the mystique of the Citadel intact, and a visit to the Citadel Museum on campus offers a great testimonial to the academy’s service to our nation. Sullivan’s Island is the closest barrier island to Charleston and has historically been the city’s first line of defense since Capt. 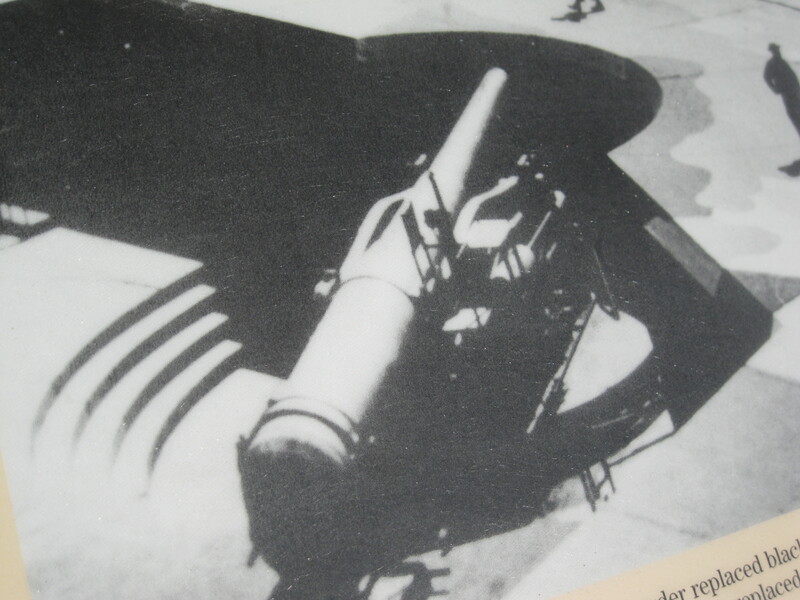 Florence O’Sullivan mounted a gun overlooking the harbor entrance in the late 17th century. In 1776, “Sullivan’s Fort” was built from palmetto logs to defend Charleston during the Revolution, and in the same location Fort Moultrie was built in 1809, and was the fort that Federal troops evacuated to enter Fort Sumter in the fateful days after Secession in 1860. Fort Moultrie was Charleston’s most prolific Confederate defense during the Civil War, and nothing got past it other than friendly blockade runners. After the war, Fort Moultrie again became a Federal fortification, and served as an active military base until 1948.